According to UK Chinese Times, Steven Cheung (Zhang Jinglong), a 19-year-old British Chinese standing for the London Region of the European Parliament Elections, is winning support from local Filipino community. Cheung is striving to get more votes in the last few days before polling in order to become the first British Chinese to win an EU seat. Carlos, trustee of a local Filipino youth organization, considers Steven Cheung's bid as a milestone in British Asian history. He thinks Filipino immigrants are faced with the same problems as Chinese immigrants. They also need a representative to speak for them. As a young British Asian, Steven Cheung has a passion for and experience in handling public affairs. "We will give him our full support and best wishes for success," he said. As an independent candidate, Steven Cheung has won the approval of many London citizens because of the recent expense scandal among Parliamentary Parties. He promises to eliminate corruption and reduce waste in the European Parliament if elected. Also he plans to donate part of his income to set up a charity fund for community affairs. "The scandal is disappointing," said Cheung. "I hope that I can beat corruption in the parliament with the support of voters, and restore public trust in politics." Cheung also expressed his special gratitude for the support from the local Chinese community. He asked British Chinese to value their votes and to help canvass for him among other London citizens. Cheung said he could expect success if every British Chinese voter would vote together with a friend for Cheung on polling day. "We have maintained our silence for more than 150 years," he said. "I would like to see a change in British Chinese involvement in European politics." According to the London Chinatown Chinese Association (LCCA), Cheung had won public support for his concern about British Chinese lives and his devotion to the local Chinese community. They hoped Cheung would successfully step into the European Parliament and represent the views of Chinese immigrants. The Chinese Students and Scholars Association, United Kingdom (CSSA-UK) and many other British Chinese community groups have announced their support to Cheung. Lots of British Chinese have promised to help distribute leaflets for him to attract more voters. Johny Ong (Wang Dazhi), young founder of EXODUS Dance Group, has created a new dance to support Cheung. Cheung's campaign team also plans to canvass for him on Facebook and YouTube during the last days, and remind voters to cast their votes for Cheung on the polling day by telephone or mobile phone short messages. Many busy British Chinese will try to make time to cast their votes for Steven Cheung, and some of the older generation say this will be the first time that they have cast their votes since arriving in Britain. Since there are no Chinese characters on the ballot paper, some have written Cheung's English name and candidate number on a piece of paper in order to canvass for him. "I will never forget their concern and help," said Cheung. "I hope I can win the opportunity to fight for their rights and interests." 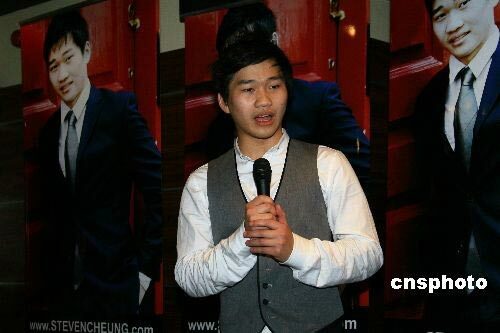 The latest survey carried out by GETACTIVE.UK.COM, an internet portal for British Chinese community, shows that Steven Cheung has a 72 percent favorability rating among the London Chinese community, far exceeding any other candidate. However, the survey also shows that no more than 50 percent of the British Chinese population is on the voter's register. As a result, Cheung must win more support from other communities. Cheung has established a special channel on the Internet to inform British Chinese of the latest election news and to communicate online with voters. Cheung used to be a DJ on Spectrum Radio International. He had to stop working there for several weeks because the British election regulations forbid any candidate to work as a host of a radio or TV show. "I feel the pain of those British Chinese who are silent due to the lack of opportunity to make themselves heard by the government, though faced with a lot of problems," said Cheung. Considering those who have no voting right and no way to express themselves, Cheung urged the British Chinese with a vote to make full use of it. "Let's join forces and show our determination to the British politicians on June 4," said Cheung. He promised to improve the social status of British Chinese and protect their rights and interests if elected. Cheung urged British Chinese at all social levels to help canvass for him and make a difference to the history of European Chinese. He said they need more volunteers to help distribute leaflets and put up posters. Also they need more people to canvass for him among their social networks and remind their families and friends on the phone or the Internet to cast their votes for him on June 4. Steven Cheung won the Princess Diana Award for his work in the community in March 2009. He was also elected as an Olympic Ambassador after London won the right to host the Games.